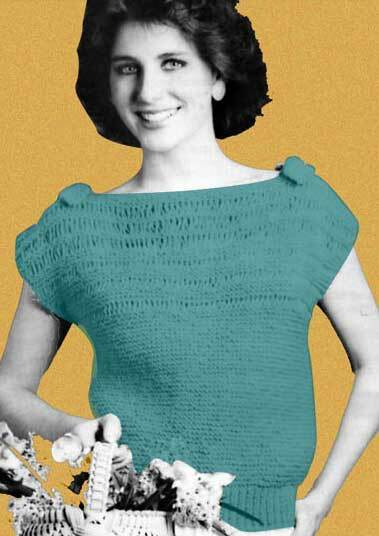 It's so easy to knit our Garter Stitch Top. Create two rectangles and join them along the side seams. To make it easier for beginners, we did not use abbreviations in the pattern. 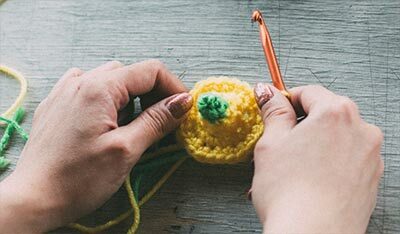 Abbreviations have not been used in these instructions in order to make the language more easily understood You should, however, familiarize yourself with the abbreviations, symbols and terminology found in commercial knitting patterns. Bust size:	32"	34"	36"	38"	40"
Finished size:	34"	36"	38"	40"	42"
Directions are given for bust size 32. Change for sizes 34, 36, 38, and 40 in parentheses. 4 stitches = 1" and 8 rows (4 ridges)= 1"
Be sure your own gauge corresponds with this gauge. Adjust needle size if necessary. You must begin this pattern, and all patterns, by making a gauge swatch. Understanding gauge is the key to the successful fit of knitted and crocheted garments. Gauge is the number of stitches to the inch and the number of rows to the inch that result in your knitted or crocheted fabric. It is essential that you achieve the gauge specified in your patterns in order for the garment to fit correctly. Gauge is determined by several factors: the yarn weight, the needle size, and the tension of the knitter. This pattern calls for worsted-weight yarn and #10 needles. The gauge is 4 Garter stitches to 1" and 8 rows (or 4 ridges) to 1". With #10 needles and worsted-weight yarn, cast on 16 stitches. Work 32 rows in Garter stitch (knit every row). Bind off. Measure your swatch by laying it on a flat, firm surface without stretching or pulling it. Your swatch should measure 4" by 4", if you have achieved the correct gauge. If your swatch does not measure 4" by 4", you are off gauge and will have to make adjustments. If your swatch measures smaller than 4" by 4", knit another swatch using the next larger size needles. If your swatch measures too large, knit another swatch using the next smaller size needles. Work your gauge swatch until you come as close as possible to the specified gauge. cast on, knit (k), purl (p), yarn over (yo) increase (inc), slip (sl), bind off. Repeat instructions between * * the number of times given in addition to the original. Row 1: (right side) Knit. Row 2: Knit 1, * knit 1, yarn over. * Repeat between ** across row, end knit 1. Row 3: Knit 1, * letting yarn over loop drop, knit 1. * Repeat between ** across row, end knit 1. Row 2: Knit 1, * knit 1, yarn over twice. * Repeat between ** across row, end knit 1. Row 3: Knit 1, * letting both yarn over loops drop, knit 1. * Repeat between ** across row, end knit 1. Starting at lower edge with smaller needles, cast on 67 (71, 75, 79, 83) stitches. Repeat between ** across row. Row 2: Knit 1, * purl 1, knit 1. * Repeat between ** across row. Repeat rows 1 and 2 until 2 1/2" from beginning, last row is a wrong side row, and increase 1 stitch on last row. There are now 68 (72, 76, 80, 84) stitches. 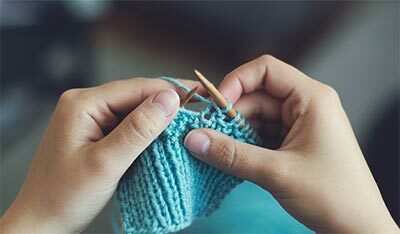 Change to larger needles and work in Garter stitch (knit every row) until 12" from beginning, or desired length to underarm, last row is a wrong side row. Mark last row for underarms by weaving a thread of contrasting color through center section of row. Work Pattern Stitch #1 for 3 pattern repeats. Change to Pattern Stitch #2 and work for 3 pattern repeats. Yoke should now measure about 7 1/2" from underarms marker. Continue to work in Garter stitch until yoke measures 8 (8, 8 1/2, 8 1/2, 9)" from underarm marker, last row is a wrong side row. (right side) Bind off 12(13, 14, 15, 16) stitches, knit next 7 stitches and slip these stitches to a stitch holder for tie, bind off next 30 (32, 34, 36, 38) stitches for back neck, knit next 7 stitches and slip these stitches to a stitch holder for tie, bind off remaining 12 (13, 14, 15, 16) stitches. Break off yarn. Row 1: (right side) Knit 2 together, knit 3, knit 2 together. Row 3: Knit 2 together, knit 1, knit 2 together. Row 5: Knit 3 together and fasten off. Work other tie in same manner. Finishing: Sew or weave side seams from lower edge to beginning of yoke section. Sew or weave shoulder seams for only 1 1/2" from each armhole edge. Tie front and back ties together.